You have been redirected from my old blog at laurelindon.com to my new blog. Welcome! When the summer melting season ended in 2007, the icecap floating in the ocean over the North Pole had shrunk to its smallest size ever recorded. More than one-and-a-half million square kilometres that had been covered with ice the year before was open ocean. According to satellite data, the remaining summer sea ice measured almost forty per cent less than the average for the period of 1979 to 2000. The event was a serious confirmation that had been suspected for a while in the scientific community: that the Earth may be prone to abrupt climate change and tipping points. The science of non-linear change is challenging our notions of what climate change is and when it will occur—and it is utterly alarming. Minimum summer Arctic sea ice extent compared to the average from 1979 to 2000. Source: NASA Goddard. We tend to think of climate change as something that happens very slowly, over a very long time and that its more serious effects are still decades away. Global warming has, up until now, proceeded slowly and gradually. Since the Industrial Revolution, about one hundred and fifty years ago, the average temperature of the whole world has increased a little less than one degree Celsius (1.5 degrees Fahrenheit). Most of us would not even be able to notice that difference on our skin. As of yet, climatic changes in industrialized countries have been relatively modest, and modern, city-dwelling people have been pretty well insulated from their effects. It has not helped that a lot of climate change activism has promoted the idea that we ought to cut greenhouse gas emissions to save our grand-children, giving the impression that we have lots of time to solve the problem. We are learning now, however, that this idea is very likely tragically wrong. Climate change is not a distant threat—it is with us today. The Arctic is changing faster than ever predicted, losing ice and snow cover at a alarming pace. The dramatic ice loss of 2007 was only a harbinger of things to come: in 2011, the minimum record was smashed again, by a further three hundred and seventy thousand square kilometres. The remaining ice is now much thinner than before, reduced by sixty-five per cent between 1975 and 2012. On top of that, the decline in Arctic sea ice is only one of many disturbing signs of accelerating climate change in the Arctic. This is not only bad news for Indigenous Peoples, polar bears and other inhabitants, it is also a disaster for the rest of the planet, because it is a crucial temperature regulator in the Earth’s climate system. Much of the Arctic acts like a giant sun reflector for Planet Earth. The white surfaces of the icecap, the Greenland ice sheet and the north’s extensive winter snow cover, help reflect a lot of sunlight back into space. Think about the difference in temperature between a white surface and a black surface in the sun—where the black surface absorbs nearly all the light and heat that hits it, the white is much cooler because it reflects most of the light. In climate science, this is called the albedo effect, where albedo is a measure of how reflective a surface is. The concept of global warming is based on the premise that there used to be a rough balance in the Earth’s temperature and climate, based on a stable albedo for the planet as a whole and a more or less stable amount of greenhouse gases in the atmosphere. Arctic ice is a crucial part of the climatic balance that we have been enjoying for thousands of years, keeping the average temperature in a range that is congenial to the flourishing of human civilization. Map showing how much warmer 2016 was than the long-term average. Source: NASA. Therefore, it is highly problematic that the Arctic has been warming more than twice as fast as the rest of the planet during the last fifty years. 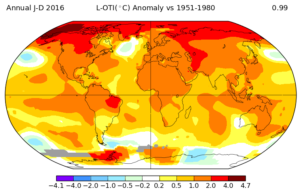 In 2016, the region was more than two degrees Celsius warmer than the average between 1981 and 2010, with January 2016 being a full five degrees warmer than average. Arctic amplification, as the phenomenon of Arctic warming is called, is making mincemeat of official climate change forecasts, which say dire effects of global warming should still be decades away. Climate models have previously predicted that the Arctic Ocean would be ice-free with emissions-as-usual sometime between 2070 and 2090. The new estimate is that the North Pole could be open water towards the end of the 2030s. That’s only twenty years from now. The reason for this dramatic speed increase is first and foremost connected to the ice-albedo effect. As ice melts, it removes an important back-stop that has allowed the Earth to keep some of its cool. When sea ice melts, it exposes the underlying sea, which is much darker and acts like a sponge for the sun’s heat. And when the Arctic Ocean gets warmer, it starts melting sea-ice or making it harder for it to form. This becomes the basis for a self-sustaining process, or positive feedback loop, where warming begets melting begets more warming. The Greenland ice sheet is also part of this feedback loop, as much of the dirt and soot collected on the surface of the ice is not washed away, but gets piled on top. As this layer gets thicker and thicker, the ice becomes less and less white, absorbing more and more heat—and so it goes. A severe and mounting threat is that the ice-albedo feedback loop is not only self-sustaining, but that it may trigger a ‘tipping point’ in the global climate system. Unlike what Malcom Gladwell describes in his book, climatic tipping points are not magical, but matters of life and death. A tipping point is the moment a process or mechanism shifts from one state to another. A see-saw, for example, may sit perfectly balanced on top of its balance point, but add a little weight on one side and its starts tipping. Once a tipping point is crossed, the force of change is so great that it becomes unstoppable, and the see-saw pivots over into a new condition. In the case of the see-saw, that shouldn’t entail any drama (though if the force is great enough, someone might hit their tailbone quite hard), but with the climate, it’s less certain. Scientists are increasingly worried that tipping points may be imminent in the Arctic, and that we may even have already crossed one. The data is suggesting 2007 may have been a tipping point—a point where the whole climate system was jolted out of its relatively stable condition, into a new and unknown state. Since then, the melting has only accelerated, both on Greenland and in the Arctic Ocean. Because the melting feeds back on itself, the endpoint may now be a completely ice-free Arctic, at least in the summer. If we have actually passed a tipping point, it means that even if we stopped emitting CO2 today, we would be unable to stop the runaway climate train. What’s worse, melting sea ice could become a gateway to a far more insidious threat, coming from the thawing soils of the high north. For millennia, the permafrost has safely locked away more than a billion tonnes of carbon in the soils, lake beds and sea floors of the Arctic. There are two major ways this carbon could be released. The first involves soils on land, when old organic material thaws and starts to decompose. As microbes attack old plant remains (and sometimes animals, like mammoths), they release carbon into the atmosphere. The more permafrost that thaws, to a greater depth, and the longer the summer growing season, the more these bacteria will manage to chew through. Emissions from thawing permafrost would come on top of critically high human emissions. The second way carbon could be released is worse, and it involves methane in frozen Arctic sea beds. Methane is a very powerful greenhouse gas with, molecule for molecule, about twenty-five times the warming potential of carbon dioxide over the long term (it helps only a little bit that the lifespan of methane in the atmosphere is only twelve years). This methane is trapped in a crystal structure with water, forming a flammable, ice-like substance, known as methane hydrate or methane clathrate. It also has another name: fire ice. As long as it remains frozen and under pressure, methane hydrates remain stable, but the rapidly warming Arctic Ocean is making scientists worried that the release of methane from this source may be increasing. This is another example of a positive feedback loop, and if it starts in earnest, it could become another unstoppable tipping point. The good news is that there is little evidence that we are in danger yet of hitting permafrost tipping points—yet. Except for the ice-albedo effect, there is a great deal of uncertainty connected to tipping points and ‘non-linear’ changes in the climate. The Arctic permafrost is thawing, and this is causing increasing emissions, but the self-reinforcing effect is not very great compared to overall emissions from human sources and the effect of Arctic amplification. When it comes to methane hydrates, there is little evidence that any significant deposits have become destabilized yet. Meanwhile, scientists vigorously debate how prone sea bed hydrates really are to global warming. We provoke these tipping points at our peril. The bad news is that it is in the nature of tipping points that we don’t know when they can occur, and the consequences are massive. With hundreds of millions of tons of methane added to the greenhouse effect, the planet could become several degrees warmer in a very short time, perhaps as little as a decade. We would be relegated to being passengers on a wild ride of rapid and historically unprecedented climate change, only able to observe, helplessly, as species go extinct, deserts spread, oceans rise and the weather goes haywire all over the place. On top of all this, there are yet more tipping points: a recent report prepared by the Stockholm Environment Institute for the Arctic Council found nineteen possible tipping points in the Arctic, though not all of them involved severe effects for the climate. There is now a website with a database of possible tipping points (regimeshifts.org), covering not just the Arctic. Just to mention a few (not all of them in the database yet), the Gulf Stream could shut off, as it has before, the Amazon rainforest could whither and burn under prolonged droughts, or the life-giving Indian monsoon could change its timing, size and path. We provoke these tipping points at our peril. Iconic picture of a polar bear struggling to stay on a tiny iceberg. 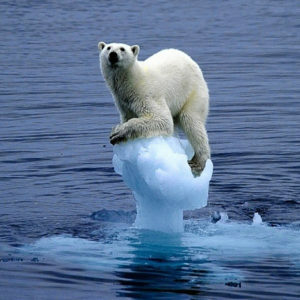 The hapless polar bear on a tiny iceberg has become an icon of global warming. Polar bears live on sea ice most of the year and rely on it for catching food (they are incredibly inept hunters on land). People too rely on ice for hunting and fishing. On the north coast of Alaska, the summer sea ice used by Indigenous people for fishing is now completely gone. People also rely on the permafrost, inhospitable though it is, which has kept the ground firm and stable. But as global warming and Arctic amplification becomes more forceful, ground that previously stayed frozen below a certain depth now thaws in the summer, causing trees and houses that previously stood on a firm foundation to subside or keel over. When the thaw comes earlier and earlier in the spring, important roads become unpassable. People in the high north have historically made very small contributions to global warming, yet they are on the frontline of climate change. Some changes now appear unstoppable, such as the complete melting of the Arctic icecap. Globally, the effect of this will be a rapid increase in global warming, putting ever more strain on humans, animals and plants, while reinforcing other positive feedback loops like the permafrost thaw or the melting of Greenland. Tipping points are extremely concerning because we might not see them coming; a slight change in climate might be enough to push a system across a threshold. This is extremely complex climate science, involving countless different processes and systems that all interact. Ocean temperatures in the Arctic depend on currents, the ice-albedo effect, cloud cover and many other climatic variables. For scientists, making accurate, long-term predictions under such conditions becomes nigh on impossible. That kind of uncertainty may seem like a cushion, because our evidence of climate change so far shows that it has been a pretty gradual affair. And climate change alarmism has a bad name, thanks to the many voices that want to shut down the climate debate and carry on with business as usual. The right response is to act as if we are in imminent danger of triggering dangerous climate change, and do everything we can to prevent it. Yet at this point there is very reason to be alarmed. Given how emissions still keep rising every year, we will be hard pressed to keep global warming to less than two degrees Celsius (3.6 degrees Fahrenheit) above the pre-industrial level. There is not really any evidence that two degrees of warming will be ‘safe’, and a lot of evidence that it will be unsafe, even if we avoid further tipping points. It is nevertheless vital that alarmism does not become despair. If we act quickly and resolutely to cut emissions, we may never reach the temperatures required to cross a dangerous tipping point. The longer we postpone serious action, however, the farther we push the climate system and the more likely dangerous climate change becomes. The right response is to act as if we are in imminent danger of triggering dangerous climate change, and do everything we can to prevent it. Arctic Climate Change Impact Assessment. Arctic Council, 2006. IPCC 5th Assessment Report. Intergovernmental Panel on Climate Change, 2013-2014. Arctic Resilience Report 2016. Stockholm Environment Institute, 2016. Snow, Water, Ice and Permafrost in the Arctic. Arctic Monitoring and Assessment Programme, 2017. Arctic Sea Ice Minium. NASA, 2017. In Barrow, Alaska, climate change in action. climate.gov, 2013.